Based on nuclear test data and volcano research information, a Northern Arizona University astronomer has described a new category of impact crater – dubbed Low-Aspect-Ratio Layered Ejecta (LARLE) craters. According a presentation by Nadine Barlow this week at the American Astronomical Society Division for Planetary Sciences in Denver, the LARLE craters feature a thin-layered outer residue that reaches beyond the typical range of material thrown up by an impact, known as ejecta. Barlow said she noticed the LARLE craters while examining high-resolution images of the surface of Mars during an effort to update her popular catalog of Martian craters. “I had to ask, ‘What is going on here?’” Barlow said. After researching “explosion literature,” Barlow said she and her collaborators theorized that a phenomenon known as ‘base surge’ may have something do to with the look of these novel impact craters. Base surge occurs after a large explosion and is marked by a cloud of fine material that forms and pushes out along the impact or eruption surface. The rolling cloud erodes the surface and picks up material in the process, eventually resulting in a widespread outer deposit. “So we think we’re on to something,” Barlow said. These impact craters are primarily seen at higher latitudes, essentially locations with thick, fine-grained sedimentary deposits and subsurface ice. “The combination helps vaporize the materials and create a base flow surge,” Barlow said. The low aspect ratio refers to how thin the deposits are relative to the area they cover. 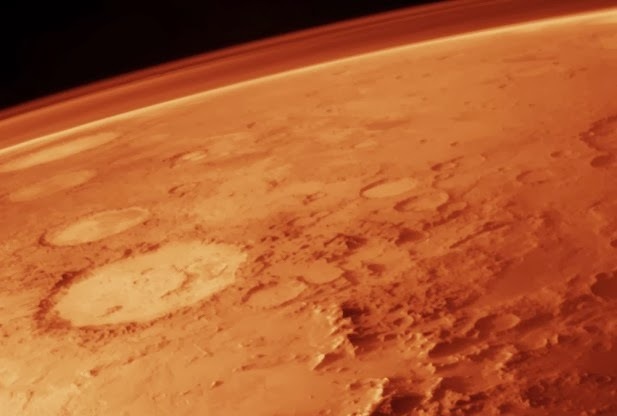 According to the team, their work was dependent on the stream of data currently flowing from the surveillance of Mars. While data from the older Mars Odyssey Orbiter was used for a global survey, the team used high-resolution images from the Mars Reconnaissance Orbiter for more detailed examinations of the Martian surface. Barlow said she plans to complete the revision of her catalog within a year, and hopes to find additional surprises, like the LARLE craters, along the way. The Mars Odyssey orbiter was launched in April 2001 and became the longest serving Mars-based craft in 2010, a title that was previously held by the Mars Global Surveyor. The Odyssey has served as NASA’s primary communications conduit for its ground-based assets and continues to do so for the Curiosity rover. Launched in August 2005, the Mars Reconnaissance Orbiter (MRO) was charged with the task of creating a high resolution map of the Martian surfaces, with a particular emphasis on finding potential landing sites. The MRO has also used its on-board instruments to gather information on Mars’ weather, atmosphere, and geology.